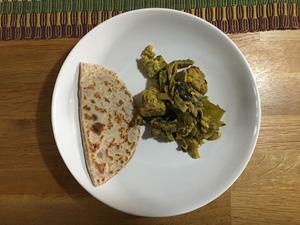 This is my take on a popular Indian dish. 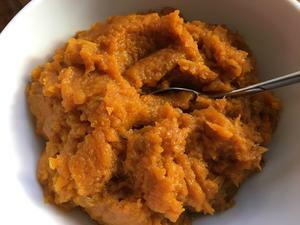 The stuffing is normally made from lentils, sweetened with lots of sugar and there is quite a bit of fat. It’s taken me a few months to rethink it but it’s worked out really well and it’s a much healthier way to make them. 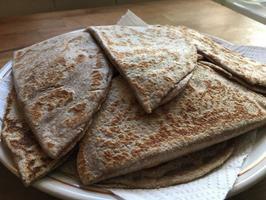 The stuffed chapatis are also round—I’ve folded them in half to make rolling them out with filling less complicated, and I actually think it works better this way. There are three parts to this recipe. They are not complicated but can take a bit of time if you’ve never made anything like this. 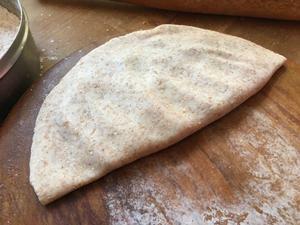 If you’ve made chapatis before, then it should be really easy. I’ve not stated any quantities because it will depend on the size of the butternut squash you use, how sweet and intense you want the flavours of the filling. 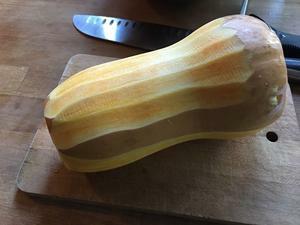 Remove skin from butternut squash and cut in half. 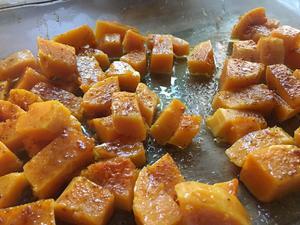 Remove seeds from butternut squash and cut into medium sized chunks. 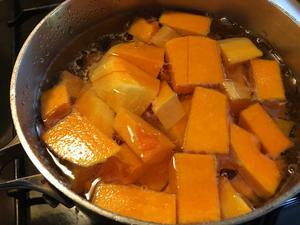 Boil the butternut squash in a pan full of water until it just starts to give. This part is optional. Place the butternut squash chunks in a large baking dish, drizzle with olive oil and bake at 200ºC or Gas 5 for about 30 minutes—until the chunks are soft. If you did not do step 3, then it will take longer for the chunks to go soft. Probably about an hour or so. Put the chunks in a large pan. Add sweetener of choice. If it’s liquid be careful not to make the filling too wet. I would probably add a liquid sweetener once the mixture is nearly ready to use. Add some cardamon—be careful how much you add because you easily use too much. Start off with a ¼ tsp. 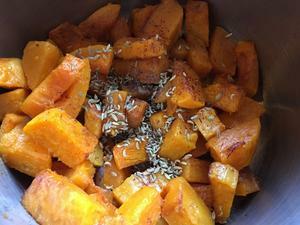 Add 1 to 2 tsp of caraway seeds. Add some saffron—a good pinch. The best way to add it, is first to heat a tablespoon gently, place the saffron in the spoon and let them ‘dry’ from the heat of the spoon. You can then crumble the saffron between your fingers and add them to the pan. Start to mash the butternut squash chunks. You could do this in a blender or food processor. If you have a potato masher it should work fine. Once it’s all mashed up—you should have a smooth filling. Check the flavours and sweetness—adjust accordingly if needed. Now to make the chapatis. If you’ve made them before, you can skip the instructions below and just go on to the third part. Add some warm water to the flour mixture but only a little at a time until most the flour just starts to stick together. Don’t over add water—otherwise the dough will be too wet. Mix with a spoon. 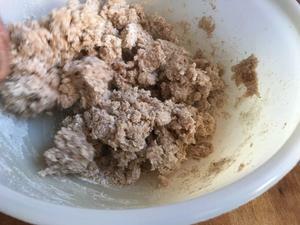 Begin to knead the dough for about five minutes with your hands. Let the dough rest for about ten minutes. It should be soft and have good elasticity. 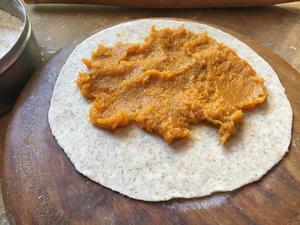 Time to make the stuffed chapatis with the butternut squash filling. Take your time —get someone to help, one person can make the chapatis and the other can cook them. 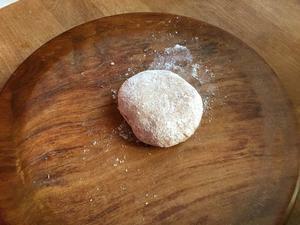 I use a small round wooden board to roll out the chapatis on but you can do it on any surface. I also use a special chapati rolling pin but you can use an ordinary rolling pin. Heat a large flat pan It needs to be very hot—so be careful! While the pan is heating—roll out the first chapati. Take a small ball of dough about the size of a tangerine. 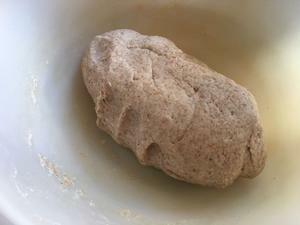 Dip the dough ball into some flour. 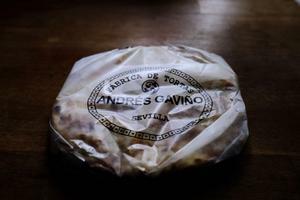 Begin to rollout the chapati on the rolling surface—until you have a thin round chapati. About a 2mm thick. Take about 1 tbsp of filling and spread it on one side of the chapati. Remember to leave space around the edges for you to seal it. You might need to experiment with the quantity of filling, as it will depend on the size of chapati you have rolled out. Fold the chapati in half and press the edges together. The pan should be hot—be careful! Place the chapati on the hot pan and let it cook for about a minute. 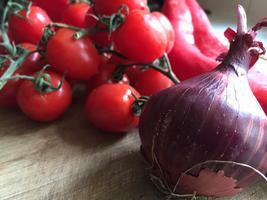 The cooked side should have a light brown colour and it should looked evenly cooked. Flip it over and cook the second side. I used a wooden tool to apply a little pressure to the chapati but you could use a cloth or wooden spoon. Once both sides have cooked just hold the sealed edge and place the bottom edge briefly on the hot pan to cook the edge. Repeat steps 3 to 8 until you run out of dough or filling. 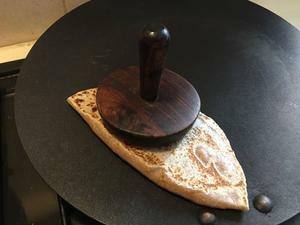 I’ve tried to make the process of making stuffed chapatis as easy as possible. If you get stuck somewhere please let me know. They are best eaten warm. I love them with a spicy curry—the sweet spicy flavours work so well together. They are great for sharing and especially when you have friends/family over.